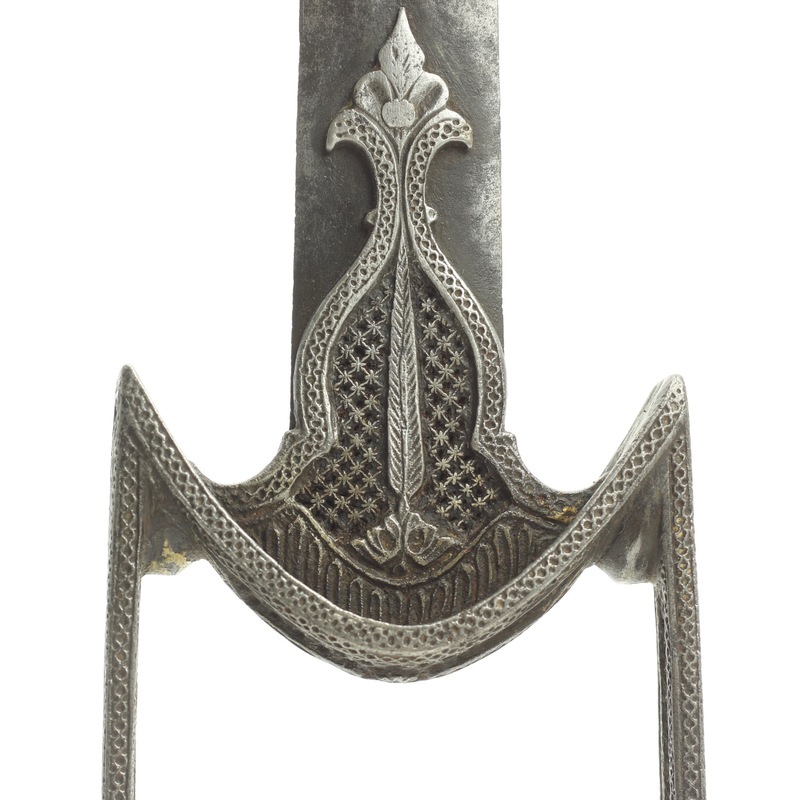 A very nice example of a South Indian katar . 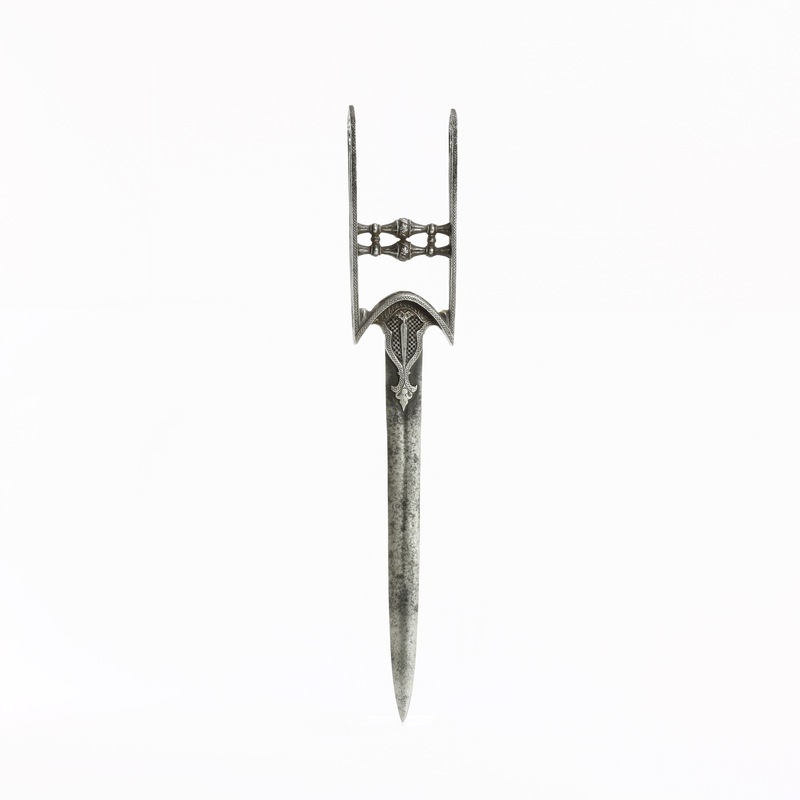 The blade is made from the tip end of a European riding-sword, finely tempered with considerable resilience. It has a lenticular cross-section with shallow grooves. 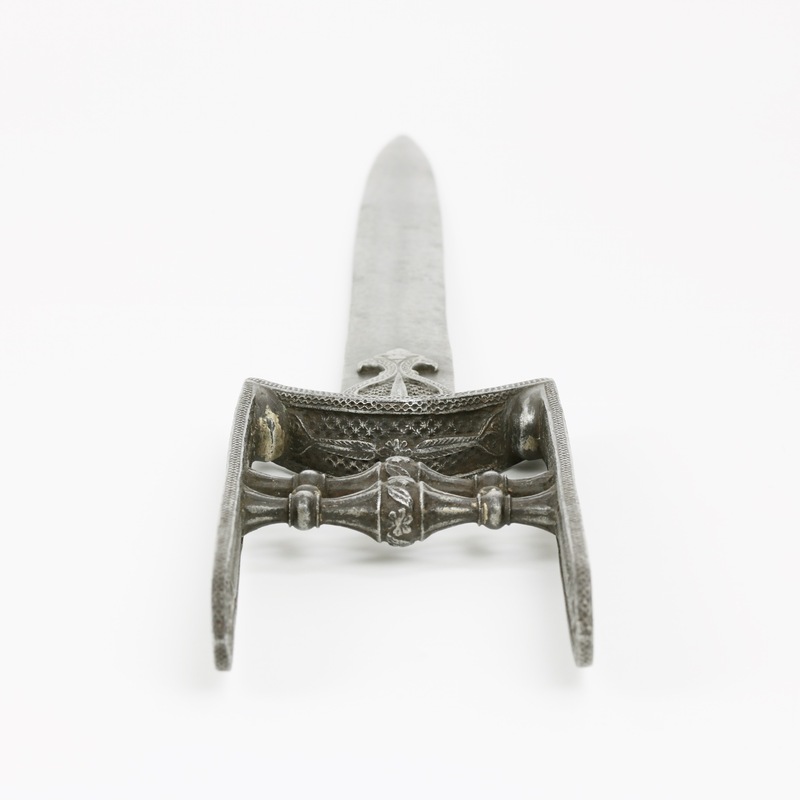 As a result, imported blades were in high demand and were often mounted in very good hilts, like this one. 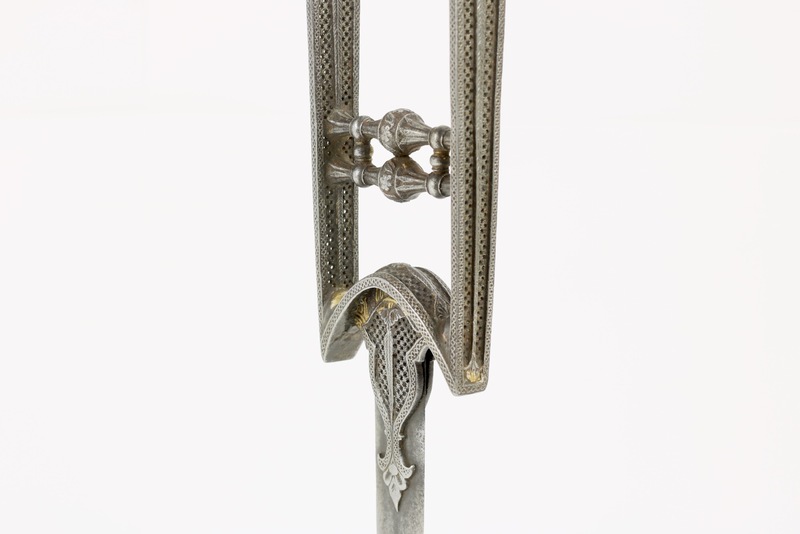 The all-steel hilt with extremely fine decorative work in geometrical patterns, with precisely cut network of apertures in the form of little stars, with fine raised borders of fine raised lines and floral motifs. The side bars are fully decorated on both sides, the crosspiece on which the blade is mounted is also highly chiseled on its reverse. In the center of the panels are elongated "tree of life" motifs. 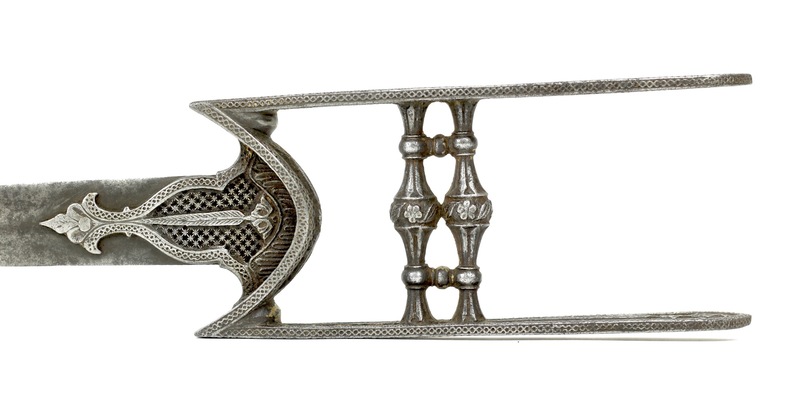 The ball-shaped handle bars, typical for 17th century South Indian work, are finely fluted and with the ball grips chiseled with floral motifs. The whole of the décor has a characteristic architectural flavor, the openwork in particular has a very architectural feel like Indian sandstone " jali " window screens of Indian mansions called haveli . 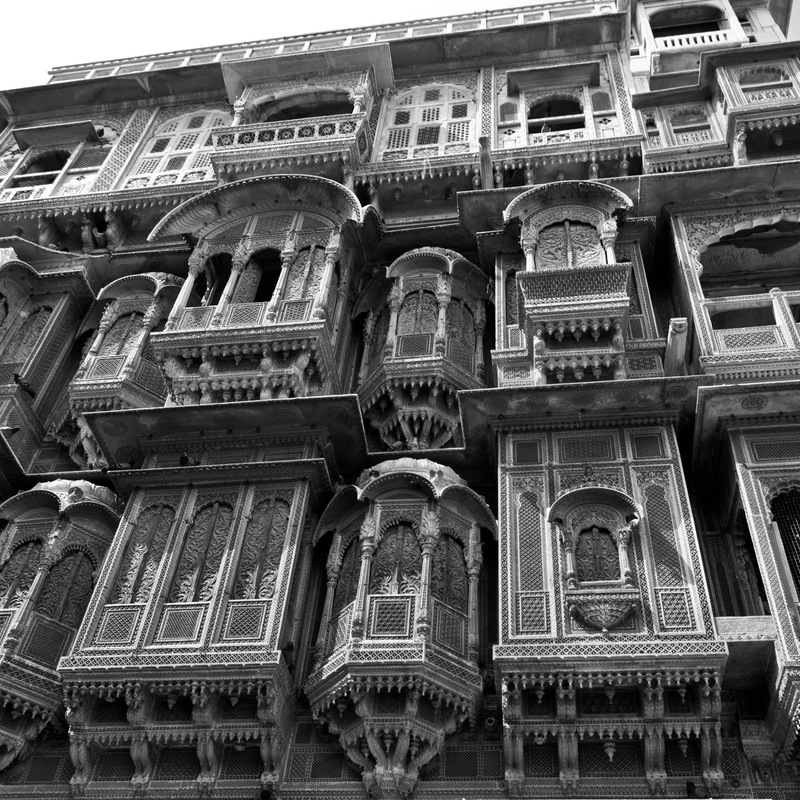 The Patwon Ji ki Haveli, Jaisalmer, Rajasthan, India. In very good condition. 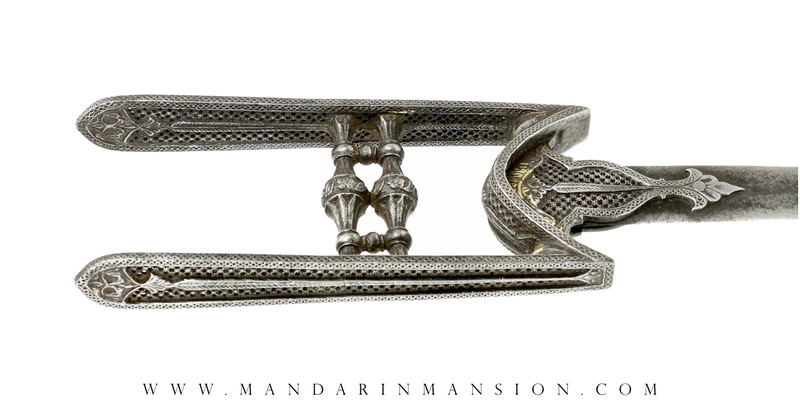 It is rare for fine ironwork like this to survive because rust easily disintegrates the fine work. There are some traces of gilt silver left here and there, indicating there was once more, probably decorating some of the highlights of the piece. Blade is patinated but without significant pitting. Good comparables are rare but there is a rather similar example depicted in Holstein, with the same handle shape and similar pierced decor with star-shaped piercing and "tree of life" center pieces. 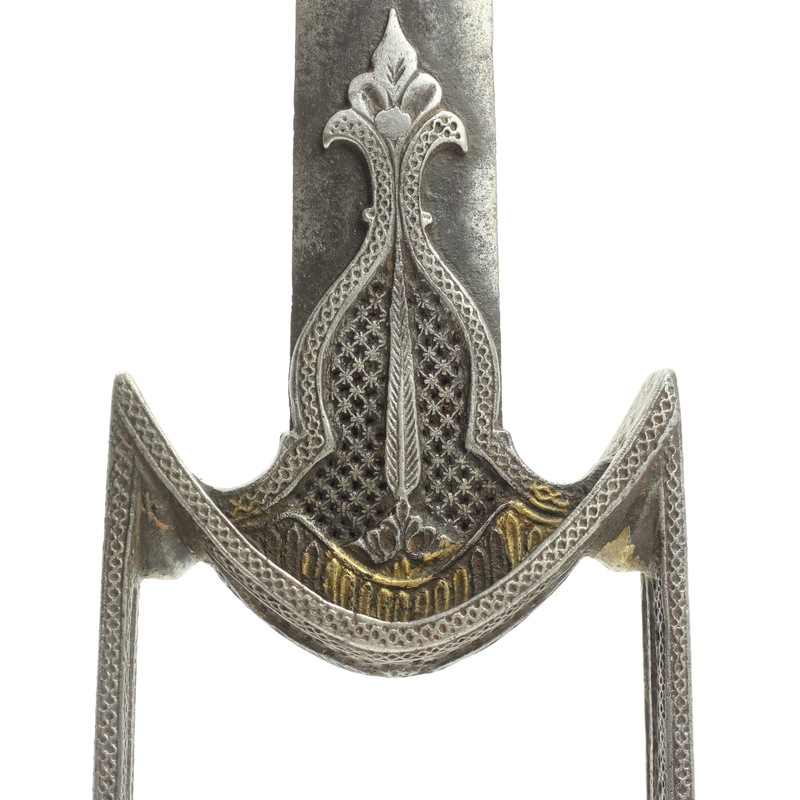 This, too, seems to have a European blade.3 Holstein suggested Tanjore or Mysore. 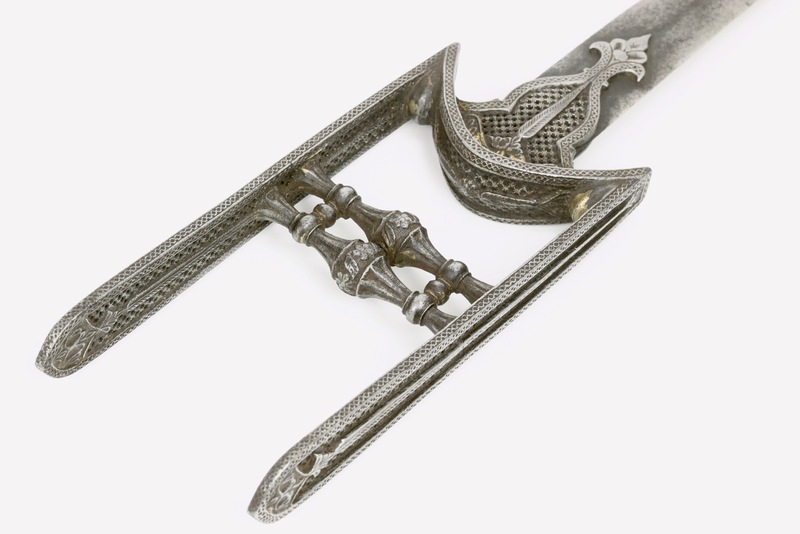 The katar in Holstein's "Contribution A L'étude des Armes Orientales Indie et Archipel Malais" . 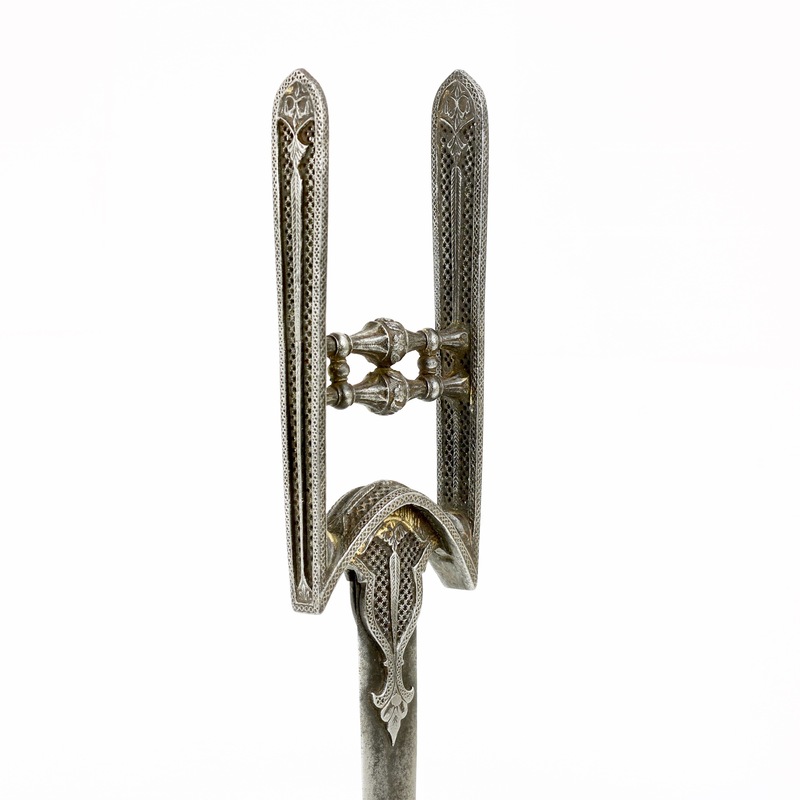 Another very similar example was in the Richard Wagner collection. 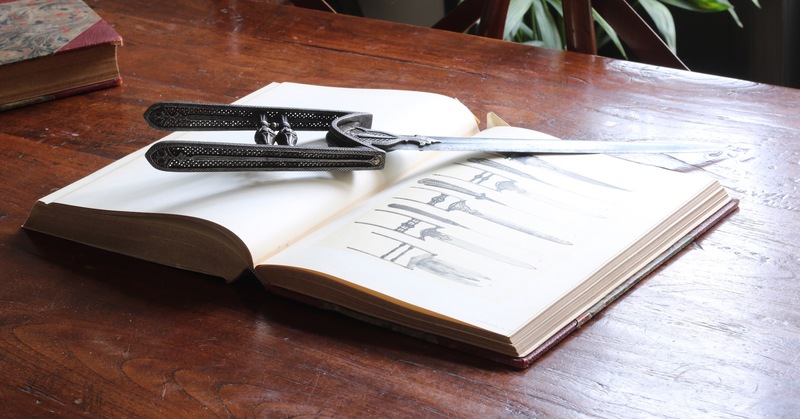 Published in Pinchot; " Arms of the Paladins, Fine Eastern Weapons form the Richard R. Wagner collection ", Andrew Mobray Inc, 2014. Page 51. This, too, was thought to be from Tanjore. Finally, a similar but lesser quality example was published in Howard Ricketts, Phillippe Missilier; Splendeur des Armes Orientales , Paris: ACTE-EXPO, 1988. Page 80. It was thought to be from Golconda, 17th century. 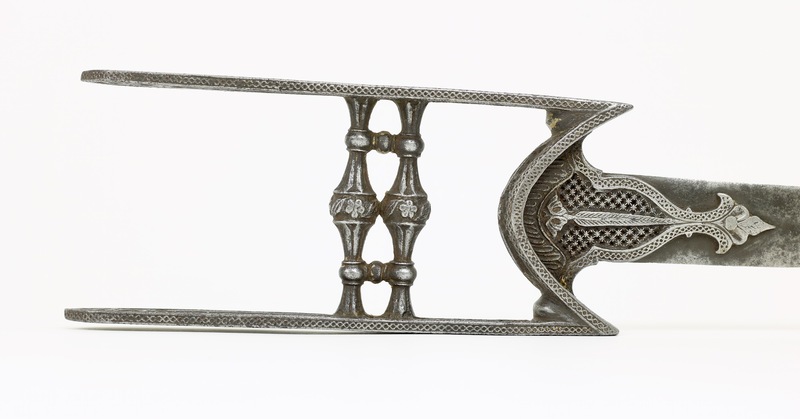 A very fine south Indian katar, probably from 17th century Tanjore, with elaborately pierced and chiseled hilt. Fine work in this quality and condition is very rare on today's market. 1. Robert Elgood; Hindu arms and Ritual , Eburon Academic Publishers, Delft, 2004. Page 202. 3. Holstein, P.; Contribution à l'étude des armes orientales. Inde et Archipel malais. , Tome Second, Les Éditions Albert Lévy, Paris, 1931. Page 30 and Plate XVI, number 69.